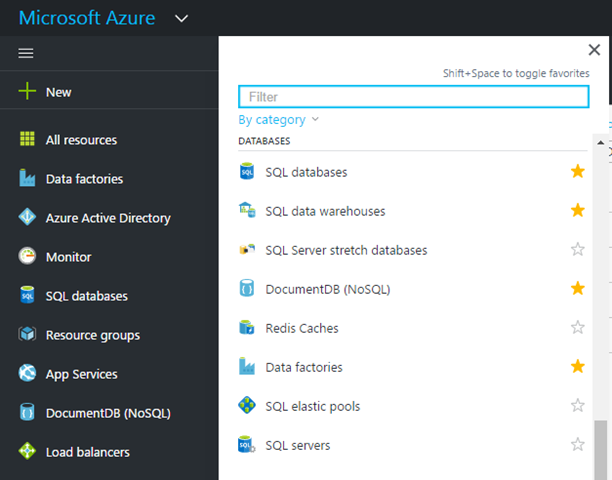 We’re happy to introduce a new top level resource blade for Azure SQL Data Warehouse that allows you to quickly manage all of your databases. You can use the SQL Data Warehouse resource blade to quickly scan through your data warehouse for details like the name, status, server, pricing tier, location, and subscription. 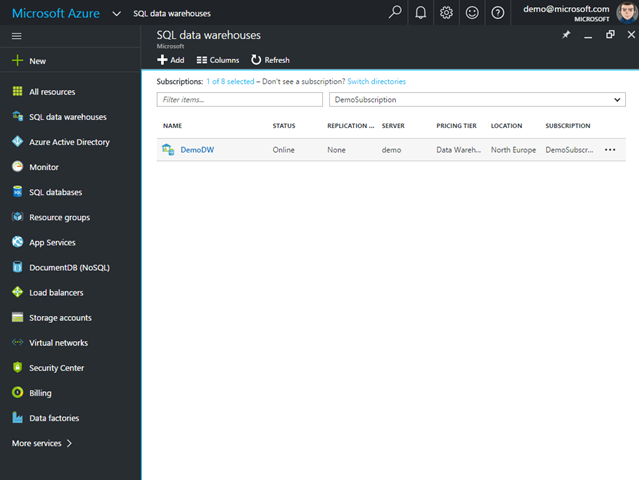 You can find the new SQL Data Warehouse resource blade on the left navigation. Simply click the SQL data warehouses link to get started. If you can’t see the new left navigation or would like to move it the top of your Azure portal, you can use the customization features of the Azure portal to place the link we’re you would like. If the link is not enabled in your portal, you will have to manual enable it. To enable the link, you can click on the Show Menu link in the left navigation. Once expanded, click on the More Services link at the bottom of the list of items. Then scroll to find the SQL data warehouses link. Simply click the star on the right, turning it to yellow, and the link will appear. You can move the link anywhere on the left navigation exposing the grab handle. You can simply drag the link to anywhere on the left navigation.